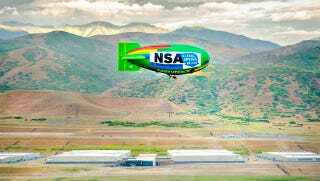 Greenpeace, along with the Electronic Frontier Foundation (EFF) and the Tenth Amendment Center (TAC) flew a 135-foot airship over the NSA data center in Bluffdale, Utah on Friday morning, carrying a giant banner which read, "Illegal Spying Below." "Rights rise or fall together. Greenpeace has learned firsthand that people cannot protect their right to clean air and water if our civil rights – including the right to free association and the right to be free of unreasonable searches – are stripped away." "The public needs to be brought into the Congressional debate around surveillance reform happening right now. We're flying an airship over the Utah data center, which has come to symbolize the NSA's collect-it-all approach to surveillance, and demanding an end to the mass spying. It's time for bold action in defense of our privacy." The airship was used to draw awareness to the potentially unconstitutional access the NSA has to broadly search or record communication records from innocent people without warrant or probable cause. The group is launching a website called StandAgainstSpying.org. The website says "we [anti-spying groups] all agree that mass surveillance is contrary to freedom and democracy. It must be stopped." Greenpeace is currently involved in a standing lawsuit against the NSA, for violating their First Amendment right of association, by illegally collecting call records.